Cyclists will ride into a “death trap” as they enter Brooklyn over the new Kosciuszko Bridge, activists say. In Greenpoint, the bridge’s new shared bike and pedestrian path will follow the highway’s alignment of the exit ramp to Meeker and Morgan Avenues and touch down at the corner of Meeker Avenue and Van Dam Street. 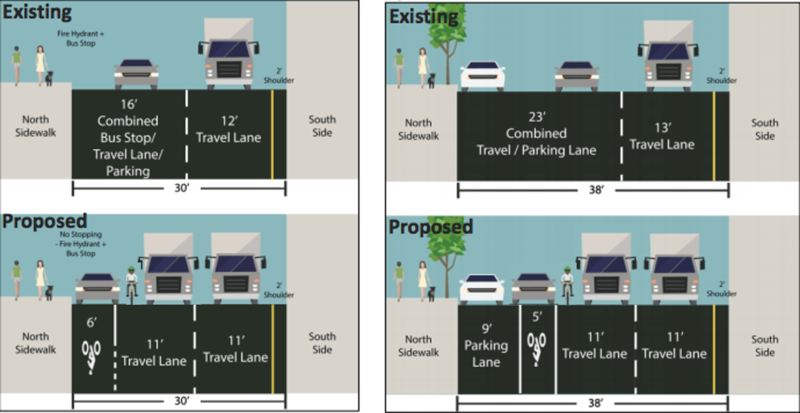 But the route would send cyclists down Meeker Avenue between Apollo Street and Driggs Avenue along an unprotected bike lane next to two 11-foot lanes of moving traffic — in a congested area next to the Brooklyn-Queens Expressway where trucks and motorists are usually flying, said Transportation Alternatives activist Philip Leff. Instead, the city should nix one of the travel lanes to slow traffic, and turn it into a parking-protected bike lane, according to a cycling member of CB1. But the rest of the Department of Transportation’s plans aren’t much better — cyclists get no protection from speedsters in a busy and industrial area that’s already dangerous to navigate. “Nothing presented changes the fact that this is one of Brooklyn’s most inhospitable areas for those outside of cars,” said Leff. 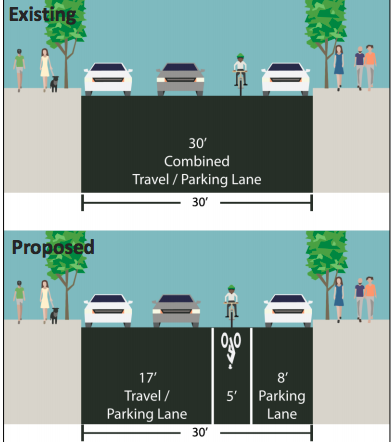 On Driggs Avenue between Meeker Avenue and Leonard Street, the city would break up a 30-foot combined parking and travel lane to put a five-foot bike lane next to a parking lane on one side and a traffic lane on the other. 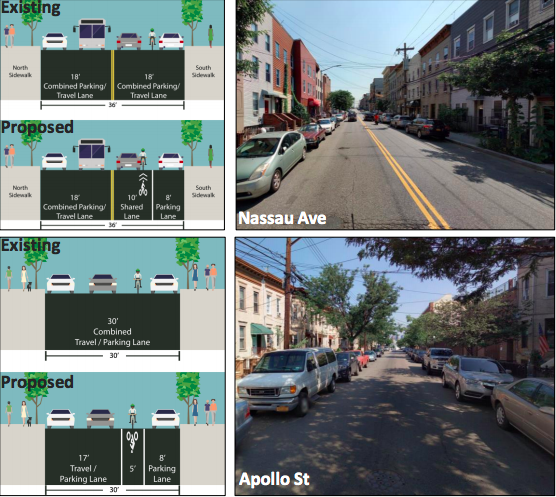 Cyclists would be forced to share the lane with traffic on Nassau Avenue between Leonard Street and Apollo Street, and would get merely a painted lane separating traffic and parked cars on Apollo Street between Nassau Avenue and Meeker Avenue. The Department of Transportation unveiled its plans for the Brooklyn portion of the new bike route during a Brooklyn Community Board 1 Transportation Committee meeting Thursday night. But it felt like the routes were merely an afterthought, and the city could care less about the safety of bikers, according to Sholl. Later this year, the state Department of Transportation will open the new Brooklyn-bound span of the bridge, which will include a 20-foot-wide path for cyclists and pedestrians heading in each direction. And the state is working with the city to connect that pathway with the larger bike network once cyclists get off the bridge in Greenpoint or in Maspeth. DOT presented plans for the Queens side on Monday night. Transportation officials say they are also working on creating a safer connection from the Williamsburg Bridge to the Kosciuszko Bridge on Meeker Avenue. Note: In the first paragraph after the last graphic, “the city could care less about the safety of bikers” should read “…couldn’t care less…”. DOT’s graphic is a fantasy. I fixed it with reality. What person at DOT honestly thinks this is a good design for humans? You forgot to add the cop ticketing the cyclist for riding outside the bike lane. Anyone know if CM Levin spoke about these subpar plans? Cyclists: This design is a deathtrap! Bill de Blasio and Polly Trottenberg’s DOT: Where parking is valued more than human life. No, it shouldn’t. “Could care less” is an idiom. There’s room for a bikeway on Meeker, but DOT has yet to come up with a design and doesn't have a timetable for doing so.